Every square foot of land has a story. Some are historic, some are easily forgotten. Some are protected and others, well, people just don’t give a damn. What makes one spot so coveted and protected? We decided to orchestrate a series of construction installations — representational sculptures that resembled the beginning of a large-scale construction project. An exercise in realism. Site specific, temporary works to solicit a conversation about public space, civic projects and representational sculpture, to explore the territorial nature of man and the sacredness of space. 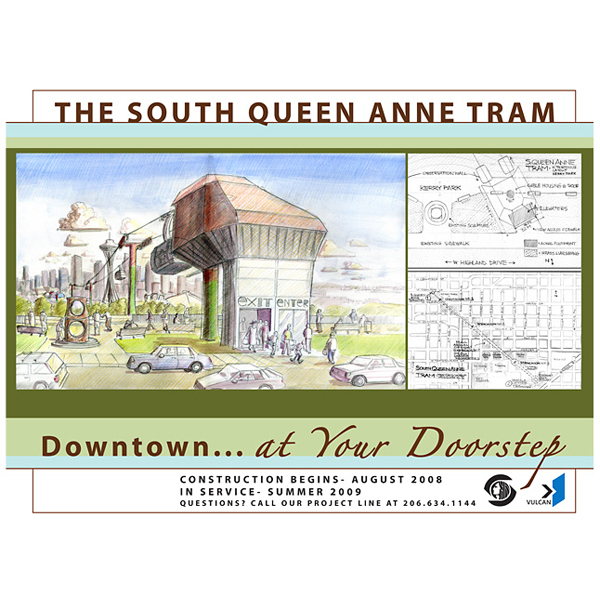 South Queen Anne Tram (SQUAT) proposed a tram station atop Queen Anne Hill. 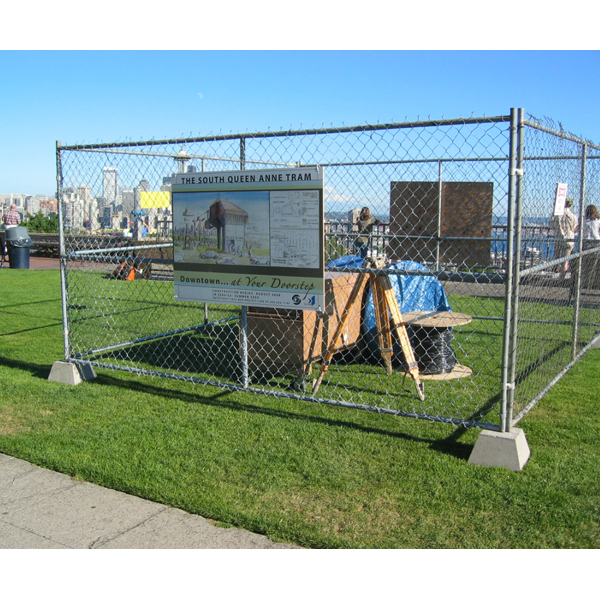 Surrounded by million-dollar homes, with million-dollar views, Kerry Park was the perfect location to introduce our installation and proposed tram station. What could be more horrifying than the thought of towering steel masts and cable cars obstructing this view and delivering strangers to this elite neighborhood? Of course, this was sculpture and any reasonable mind would easily reveal the truth of the matter. But, we thought we would see for ourselves. By 6:00 am we were suited up in our white jumpsuits and hardhats, loading up gear and heading towards the park. By 7:30 am we had completed the install and parked around the block. It was a beautiful day. We walked down to the Mecca for breakfast, made our way back up to Kerry Park by 9:00 am and just hung around to enjoy the afternoon. We paid no attention to the installation. A formal petition against the South Queen Anne Tram started around 11:00 am. It was typed and handed around on a clipboard. A series of very shiny black Mercedes stopped in the middle of the road, with driver and passengers walking around, all the while talking on their cell phones. The Fire Marshal came by around 1:30 pm and by 3:00 pm a Parks Department employee was deployed to find out what the hell was going on. Then a call came from the Mayor’s Office. You see, we had a permit from the city to do the project. Liability insurance had been secured. We were supposed to be there. But the people of Queen Anne had mobilized and attacked with zest. Our hotline number had twenty messages from angry homeowners. A fight was promised. Lawsuits were thrown around like tomatoes. For a bit it got kind of ugly. Here are a few comments we heard. When we finally brought the trucks around and started to dismantle, we weren’t sure if we were going to be harassed or applauded. And we started talking with the neighbors, the men and women who had come by two or three times to absorb this incredible proposition. Their anger turned into curiosity, and finally, into satisfaction and understanding. You could see their thoughts connecting the dots and I am convinced that they learned, maybe for the very first time, the breadth and ubiquity of art.